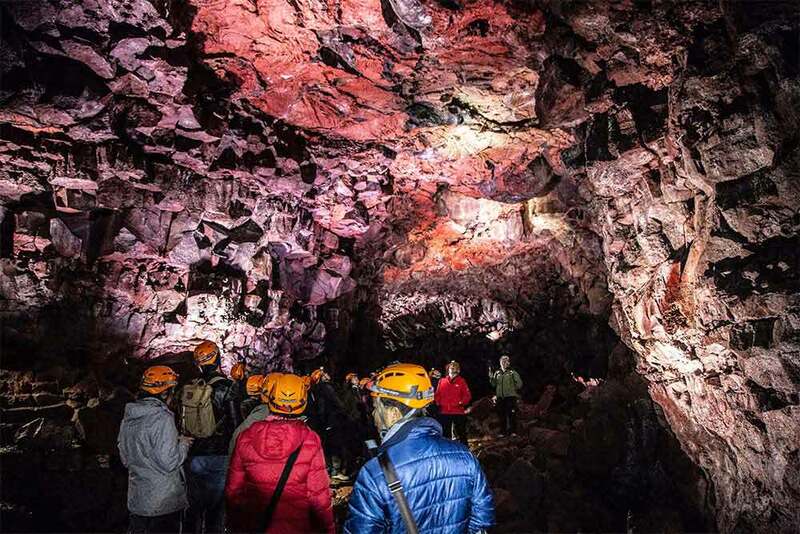 Join us into a craggy, volcanically scarred world hidden beneath the earth’s surface – to one of the longest and most famous lava tube caves in Iceland. Visit Raufarhólshellir – a stunning geological paradise that was formed after a volcanic eruption that happened around 5000 years ago. 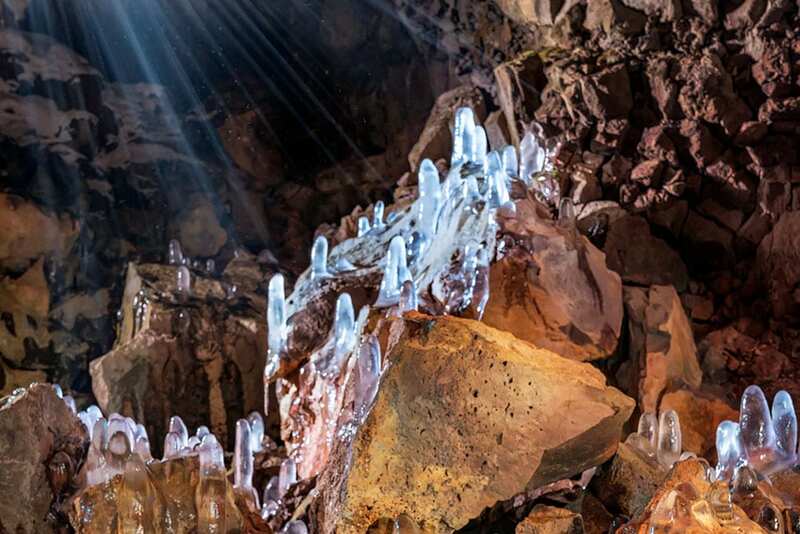 The cave is a magical place, famed for its vivid colors, fascinating rock sculptures and a host of other things that will inspire awe and wonder in equal measure. We will be visiting Raufarholshellir – a stunning geological paradise that was formed after a volcanic eruption that happened around 5000 years ago. The cave is a magical place, famed for its vivid colors, fascinating rock sculptures and a host of other things that will inspire awe and wonder in equal measure. All in the company of a friendly and knowledgeable guide, who will tell us everything that we need to know about this subterranean paradise. If you want to go on an adventure of exploration through an ancient volcanic conduit, then this tour is perfect for you. The day begins when we meet our friendly and knowledgeable guide at the entrance to Raufarholshellir, who will provide us with any equipment that we need and give us any relevant safety information. Then, once everyone is happy, we will begin walking down the narrow sloping path into the lava tube cave itself. The walk is easy in terms of difficulty, with some parts having developments like footbridges and paths to make it easier and other parts being as nature intended. This means that the tour can be done by people of all ages and abilities, however, participants must be comfortable walking on uneven surfaces to be able to take part in the tour. As we push deeper into the subterranean natural wonder, we will start to see the many majestic sights that have made it so popular, including spectacular rainbow-colored walls that have been dyed various shades of emerald, ruby, turquoise, and lilac by the mineral deposits in Raufarholshellir. The most spectacular parts are illuminated, ensuring that we can appreciate all the magic that Raufarholshellir has to offer. Our friendly guide will tell us how volcanic activity helped to craft the cave and its tubular structure will give you a great insight into how the lava flows helped to form it. Raufarholshellir is an ever-changing and ever-evolving environment and the time of year that you visit will impact the type of visit we have. 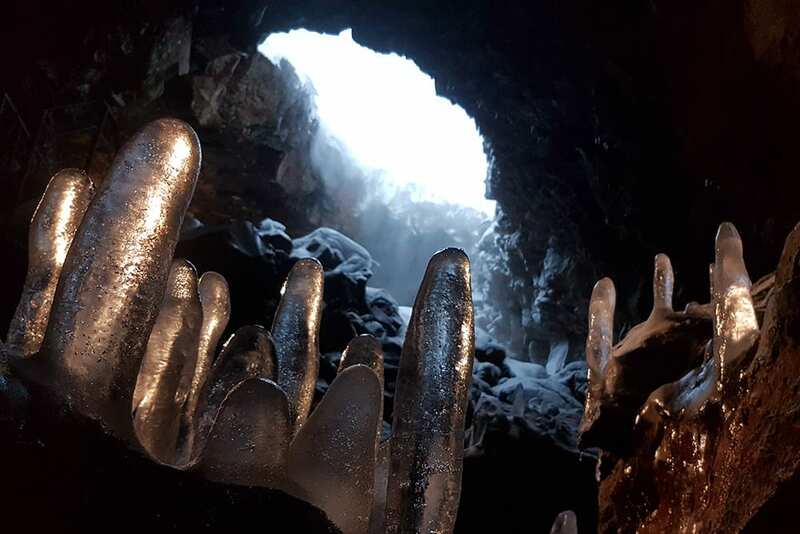 During the winter glimmering shards of ice hang from the cave’s craggy ceiling, creating a stunning visual effect that all visitors are sure to appreciate. 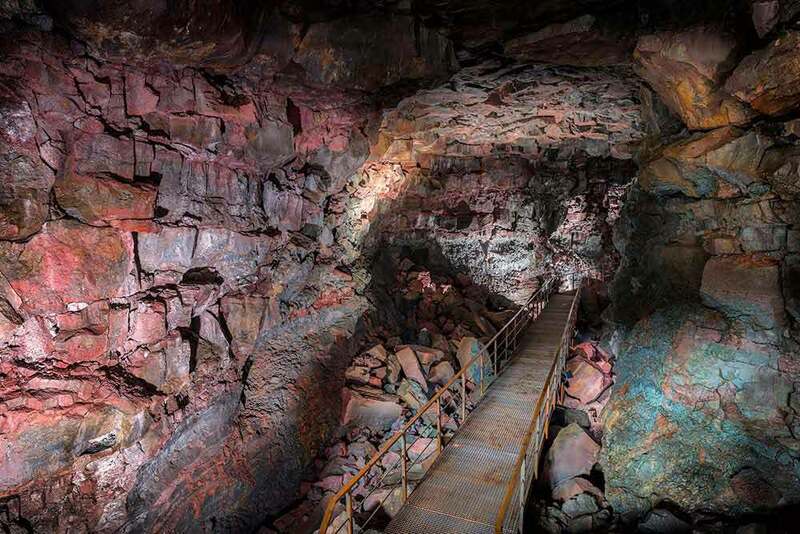 While, the rest of the year is equally beautiful, thanks to the multi-colored minerals that decorate the cave’s walls and the stunning rock formations that the lava has created. That coupled with the Raufarholshellir’s cavernous ceilings that can reach as high as 10 meters, ensure that it is a truly incredible experience that all visitors are sure to appreciate. A subterranean wonder without compare – there is no better way to appreciate the magical underground world that lies hidden beneath our feet. 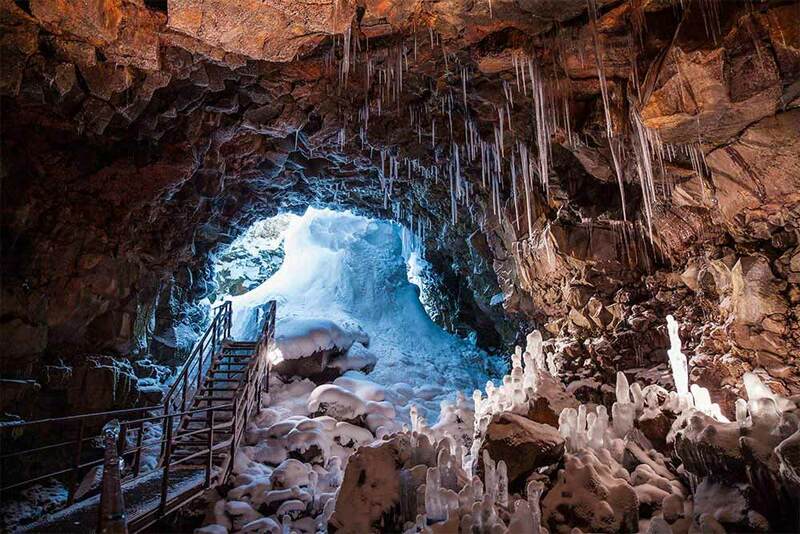 Raufarholshellir is one of the longest lava tube caves in Iceland, spanning 1360 meters the majority of which is taken up by the 900-meter main tunnel. It is most famous for the spectacular high ceiling that is contained within the middle of the cave, where three slender beams of gleaming light penetrate its dark heart, illuminating a stunning geological world of majestic beauty. 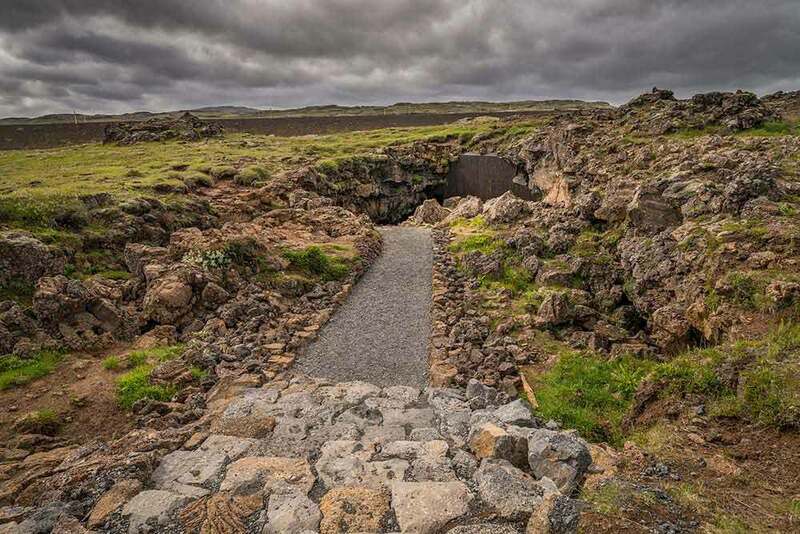 There are three smaller tunnels that snake off the main one, where cascading streams of petrified lava stand frozen in time – a fitting memorial to the convulsing geothermal energy that helped to form the cave. 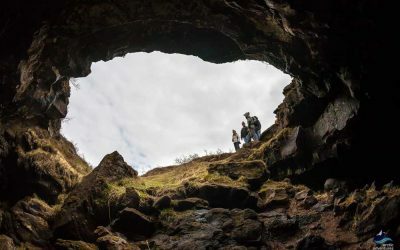 Raufarholshellir is a lava tube cave, meaning it was formed, following the sudden flash-cooling of lava during a volcanic eruption. It owes its existence to the Leitahraun eruption, which occurred around 5200 years ago in a volcano that lies to the east of the famous Blafjoll mountains. The cave was discovered by geologists in 1950 and had a host of stalactites decorating its ceiling, however, unfortunately, they have largely disappeared over the past half-century thanks to the many people who have visited the cave. If you want to explore an ancient volcanic conduit that is mesmerizingly beautiful, then Raufarholshellir may just be the place for you. The tunnel is located less than 30 minutes drive (approximately 30 km) from Reykjavík and accessible by all vehicles. Driving from Reykjavík east on Route 1 and drive for about 18 km. Turn right onto Route 39 (Þorlákshöfn) and drive for another 12 km. The parking area will be on your left hand side. This tour is offered with pickup service from Reykjavik twice per day. Please note that the tour will take approximately 3 hours in total with the pickup and drop off service. If you do need transportation from Reykjavik, please choose the “With Pickup” option in the booking widget on the right side. Remember to bring warm outdoor clothing, waterproof jacket and pants, headwear and gloves. Good hiking shoes are highly recommended.